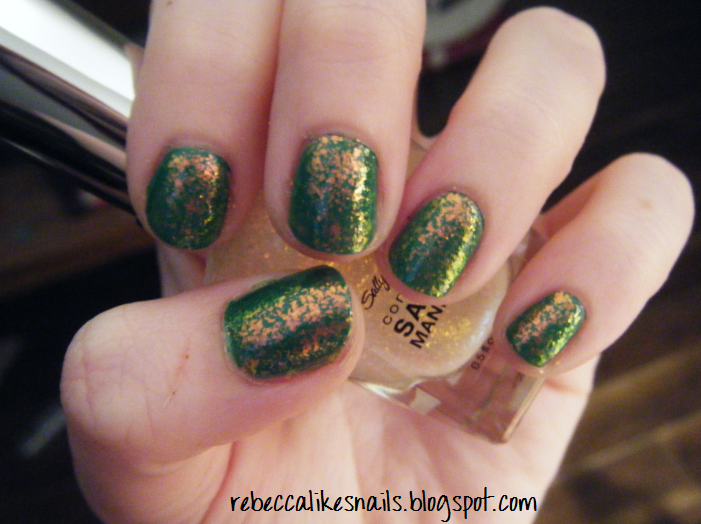 Of all the talks today about the new OPI collection and pirate's treasure, I decided to post a picture of Sally Hansen's Hidden Treasure! I know this is something we've all seen, but this is my favorite combo. This is over Sally Hansen Xtreme Wear - Going Green. I lucked into getting a bottle of this LONG after people everywhere were wishing they hadn't missed it in their towns. I even saw at least 5 bottles after I bought mine, and I wish I had have bought some spares because I could have sold them or swapped them! I'm not even a huge fan of it, for some reason, but I'm happy it's part of my collection. Oh wow i like that combo! I have yet to find Hidden Treasure anywhere around me! I have looked and looked and can't find it either. I want to see it on a teal like Milani Neon Fresh Teal. thank you aurora! and thank you jess for all your comments today! you're sweet.